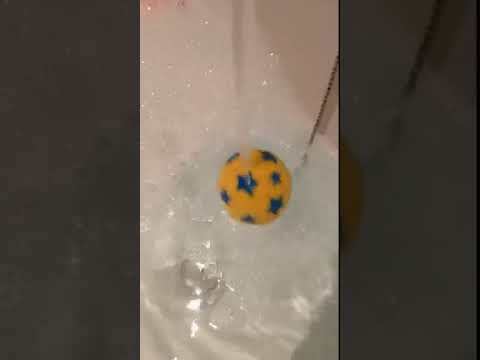 A few nights ago Ernest (my two year old son) and I made a discovery that could have potentially revolutionary impact on the field of fluid dynamics; at bath time. One of his balls had wandered under the running tap… and, as if by magic, got stuck there! Our initial thought was that this looks like the reverse of the well-known effect where a air jet can stably levitate a ball (e.g. a hair dryer levitating a table tennis ball or, for Ernest, the airjet in the ballpit at softplay). This is all due to the Bernoulli effect – the suspended ball remains stable as a small deviation to one side slows the stream on that side, increases the pressure there and hence restores the ball back to the centre. Which says it’s not the same effect when a ball is levitated by a water jet. But our ball doesn’t seem to spin as violently as theirs, but rather bobs from side to side. So now we’re confused again.